You can score high and still have tons of free time. I know that probably sounds pretty crazy. It’s hundreds of pages of things that students need to know to make it happen. I spent years struggling in school before I started to learn these strategies. Most of the challenges come from the poor strategies you’ve been taught. The solution to your study problem isn’t spending more time banging your head into the wall. The human brain naturally learns. You have all the tools you need installed in you from birth. All you need is a reminder how thousands of students have learned to use them. You can score straight A’s and enjoy the process. This book is all about the “other” strategies you can use to increase your grades. The fundamental subject I try to avoid is traditional studying. Sure… you can still study to score even higher but you usually won’t have to. So far I’ve been getting great feedback from the readers. I’d love to hear what you think of it. You can find it on Amazon but don’t buy it for $4.99. You’re a subscriber. You can get it below for free. 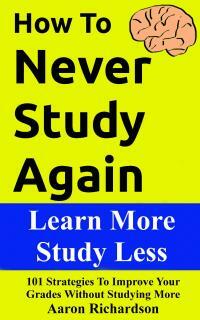 Get your free download of How to Never Study Again ($4.99 value) and exclusive members-only access to the content on this page. We value privacy. Your information will not be shared. If the download links aren’t below this line and you’re a member then please refresh this page. It’s an technical problem we’re working on. You can also access the ebook on the private link sent to you by email. Are you looking for another format? Please contact us and well get it to you.